Pricing details have been released for the range of 2009 Toyota Yaris models, and the results show a mixed bag. The addition of the five-door model for 2009 has forced a shakeup in the pricing structure in order to accommodate the new model. 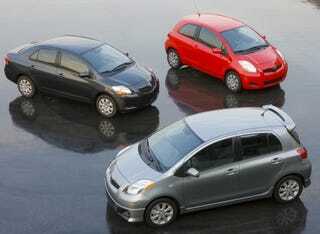 The hat-shaped Yaris three-door gets a $655 bump up to $12,205, while the sedan drops from 13,965 to 12,965. The S Sedan goes up to $15,880 from $15,825; that leaves the new Yaris five-door model in between the sedan and the S sedan at $13,305. Options, of course, can drive the pricing into the lofty fifteen-grand range. So there you have it: If you want all the performance of a Geo Metro and that new car smell, you can now get it four different ways. Full release after the jump. Torrance, CA - Toyota Motor Sales (TMS), U.S.A., Inc., today announced manufacturer's suggested retail prices (MSRP) for the three fuel efficient 2009 Toyota Yaris subcompact models. MSRPs will range from $12,205 for the three-door Liftback Base model to $15,880 for the Sedan S model when the vehicles hit dealerships later this summer. Estimated EPA fuel economy ratings are 29 mpg city/35 mpg highway/31 mpg combined for all three body styles with an automatic transmission and 29/36/32 mpg for the manual transmission models. The excellent fuel economy, combined with extensive standard equipment and fun-to-drive features make Yaris an outstanding value. For 2009, Yaris is available in three body styles: a sedan, three-door Liftback, and an all-new five-door liftback, each in Base and Sporty “S” grades. All Yaris grades will now feature a number of standard safety features, including anti-lock brake system (ABS) with Electronic Brake Force Distribution (EBD), driver and front passenger front seat-mounted side airbags, and front and rear side curtain airbags. New exterior colors for the 2009 Yaris include Zephyr Blue Metallic and Blue Streak Metallic on Sedan and Yellow Jolt and Carmine Red Metallic on Liftback. Prices for the Yaris three-door Liftback models range from $12,205 for the Base grade with four cylinder engine and manual five-speed transmission to $14,825 for the S grade with four cylinder engine and four-speed automatic transmission. The all-new five-door Liftback model prices range from $13,305 for the Base grade with four cylinder engine and four-speed automatic transmission to $15,125 for the S grade with four cylinder engine and four-speed automatic transmission. Yaris Sedan model pricing ranges from $12,965 for the Base grade with four cylinder engine and manual five-speed transmission to $15,880 for the S grade with four cylinder engine and four-speed automatic transmission.